Usher Raymond is in the midst of the 20th anniversary of the release of his first album, Usher, and has taken his immense catalog of hits on the road in the UR Experience Tour. The new tour opened on Saturday night at Centre Bell in Montreal, Quebec with a 26-song/90-minutes performance touching on all parts of the singer's career...except for his new album. UR was scheduled to be released this year but was pulled off the schedule by the singer in September, saying he wanted to take his time with it. Usher only performed Good Kisser, which was the first single from the upcoming album. 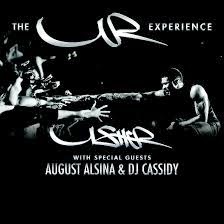 So while you might expect the UR Experience Tour to be based on the album UR, it would have better been called "The Confessions Experience" as seven if the sixteen tracks from the album were performed.